A fruit-forward honey process Sumatra with syrupy sweetness, dried fruit and cherry pulp, prune and date, herbal Thai basil impression, and a sweet bell pepper note in the finish. This coffee comes from Gunung Tujuh and Kayu Aro areas, two higher elevation areas around Mount Kerinci. There's a cooperative that serves this growing area, and who produce wet hulled, honey/wet hulled (a hybrid process coming later), and fully washed coffees. The farms in this area are planted in older Typica types, and benefit from the high slopes, situated between 1400 - 1500 meters above sea level. The typical wet hulled process method (giling basah) is a bit of a rough road for coffee. It involves bagging up wet parchment at the farms to be transported to mills, peeling the parchment off the still wet seed, and then drying the rest of the way on patios. 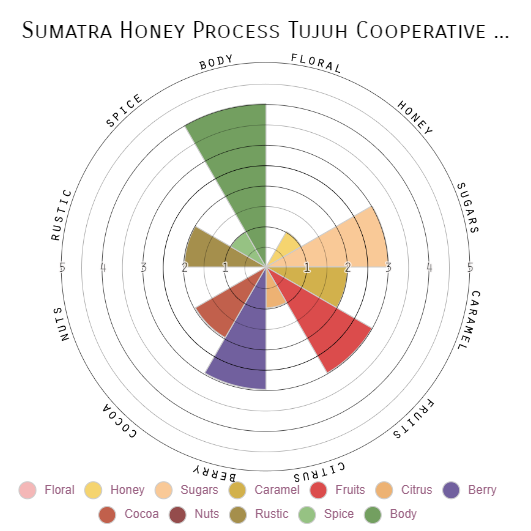 The flavor that comes with this processing method would be considered defective in most other coffee growing countries, but is what's put Sumatran coffee on the map to begin with. And let's face it, when done well, the coffees are unlike any other. This is a honey processed lot, so different than the typical giling basah method and starts with the coffee cherry being run through a mechanical demucilager leaving the mucilage (honey) intact. The coffee is then moved immediately to drying patios and beds where it will remain until dried all the way down to 11-12% moisture level.